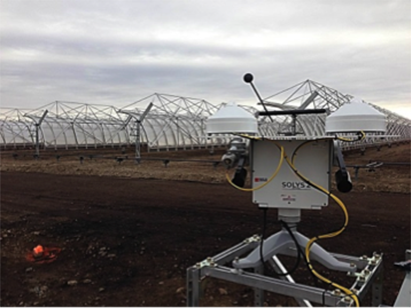 The small southern Alberta city of Medicine Hat is the first city in the world to operate a concentrating solar thermal power system (CST) in a high-latitude, cold weather location. It’s also the first city in Canada to have a solar powered steam generation system integrated into a combined cycle natural gas power plant. The system currently generates power on a demonstration basis with a solar and environmental monitoring station keeping a close eye on the performance. The City of Medicine Hat (CMH) is called "The Gas City" because it sits on sizable natural gas reserves. But several years ago, the city started an energy conservation and renewable energy program called "Hat Smart." One outcome of this program is this 1 MW CST demonstration system, which began operation in November 2014. This is the farthest north that a concentrated solar thermal project has ever been built. Medicine Hat is one of the sunniest places in Canada with an average of 2,544 sunshine hours and 330 days of sunshine per year (Environment Canada)2. Medicine Hat also enjoys a suitably high solar resource of direct normal irradiance (DNI) of 5.1 (City of Medicine Hat)1 making it an appropriate location for a CST. A Campbell Scientific environmental monitoring station, equipped with Kipp & Zonen solar instrumentation, has been installed to determine the solar resource available at the site. The station measures and collects data for global, direct, and diffuse solar radiation, as well as other parameters such as wind speed and direction, to alert the city if winds are too high to operate the solar arrays safely. The station is based on the Kipp & Zonen SOLYS 2 sun tracker that holds two CMP22 Secondary Standard pyranometers and a CHP1 pyrheliometer. Campbell Scientific Canada provides data collection, hosting, quality control, and reporting for this station through our Data Services department. Data Services collects the data remotely over a cellular modem based on a scheduled collection interval, and the data is uploaded to a Campbell Scientific server. Quality control is provided to ensure data quality and integrity. The data is then compiled into monthly reports to help both CMH and Natural Resources Canada (NRCan) determine the effectiveness of the station. 1 - City of Medicine Hat. “Alberta Innovates Technology Futures.” 31 October 2011. Concentrating Solar Thernal Energy Workshop. 4 February 2015 <http://www.albertatechfutures.ca/Portals/0/RDServices/CST%20Tech%20Workshop/9%20-%20MacKenzie%20MedHat%20Project.pdf>. 2 - Environment Canada. “Canadian Climate Normals 1981 - 2010 Station Data.” 12 January 2015. Government of Canada. 4 February 2014 <http://climate.weather.gc.ca/climate_normals/results_1981_2010_e.html?stnID=2273&lang=e&StationName=Medicine+Hat&SearchType=Contains&stnNameSubmit=go&dCode=1&dispBack=1>.